I really didn't want to like Jay Miles' Conquering YouTube. After all, what a ridiculous title, right? I mean, how short sighted can one person be but to write a book about a single website? Only thing is, when I picked it up I accidentally flipped it to Tip #68, Camera in a Coal Mine, which talks about leveraging the small cameras most novices have by putting them in unusual spots (like in a fridge) to get a unique perspective. At that bit of wisdom, I was hooked (at least hooked enough to rent the book from the library). Turns out, Conquering YouTube has absolutely nothing to do with YouTube. Really, the book should have been titled Techniques and Exercises You Need To Master To Start Shooing Quality Video. 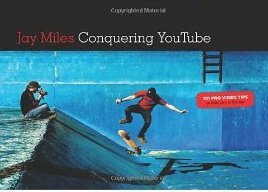 In Miles' defense, Conquering YouTube is wittier. I love how the author not only gives solid advice, but assigns useful homework assignments to really get you to master the essentials (and does it in a lighthearted, yet not overly goofy way). From learning how to manually operate your video camera to advice on editing, I've got to think that this is an excellent intro to intermediate course on video creation. I'd love to see a book that uses this same approach and format to teach photography. I definitely knew the book was have an effect on me when I started to find myself decomposing the scenes on TV. I'd find myself thinking: oh look, they used the rule of thirds there -- or, oh look, you can't see the actor speaking, I bet this clip was shot in a totally different take than the one before. Any book that can change how I see the world is a winner in my mind. If you're interested in getting serious about movies or video, or you know someone who is, this book is the way to go.